We are visiting the Ardennes Forest in southern Belgium, seeing the sites of the Battle of the Bulge. We started the trip in Normandy with a visit to the landing beaches and battlefields of the 6 June 1944 D-Day landings. Now, like the Allied forces, we have traveled east across northern France and entered Belgium. 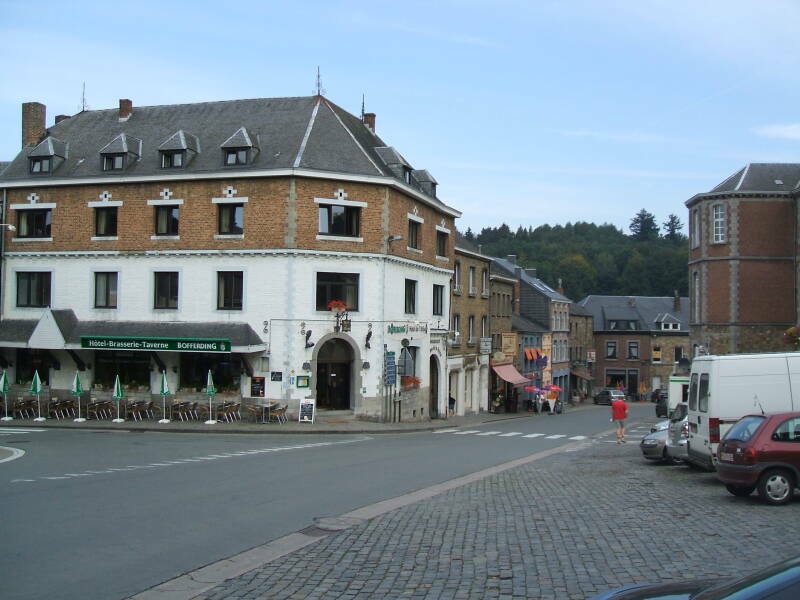 Houffalize is a small town north-east of Bastogne, just north of the Luxembourg border and barely within Belgium. Generals Montgomery and Patton met up here in a counter-attack against remaining German forces. 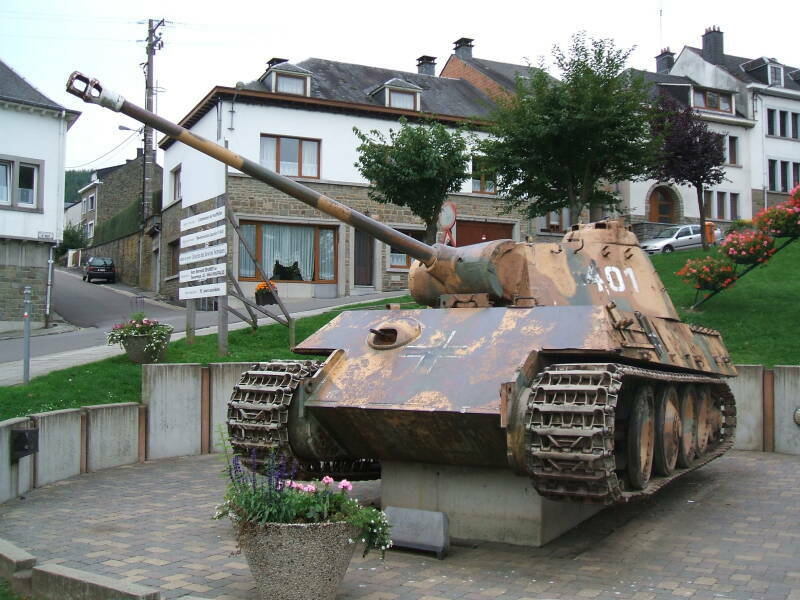 The town has a captured German Panzerkampfwagen V (Panther) tank on display. The Panzer series were medium tanks, intended to counter the Soviet T-34 and smaller than Germany's heavier Tiger series. It was a compromise design, with the same V-12 engine and better frontal armor than the Tiger, resulting in lower weight, higher speed, and better rough terrain performance. The tradeoffs in the design were weaker side armor and thus greater vulnerability in close-quarters combat, and a slightly smaller main gun, 75 mm versus 88 mm for the Tiger. They carried 79 rounds of 75 mm ammunition, either the Panzergranate 39/42 high explosive round carrying 18 grams of RDX, or the Panzergranate 40/42 armor-piercing round with a tungsten core. It also had two MG 34 machine guns with 5,100 rounds of 7.92×57 mm Mauser. 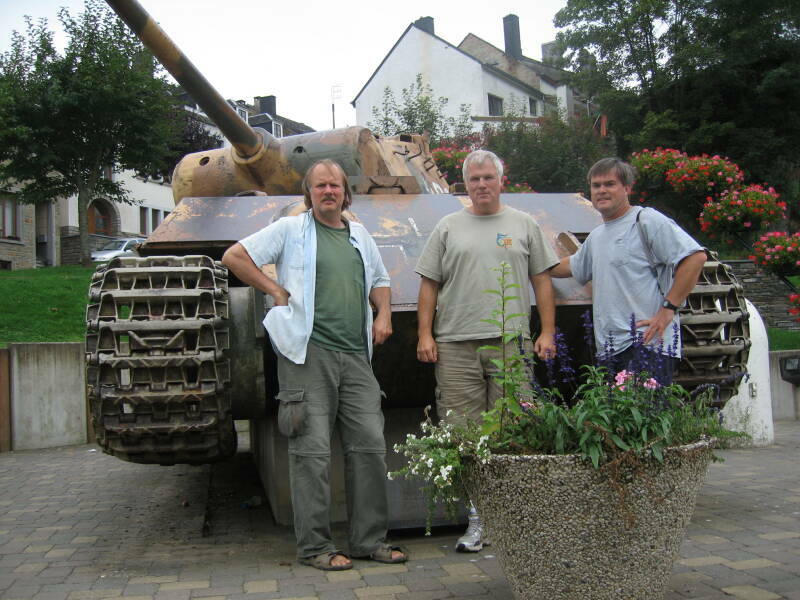 Left to right: Me, Jeff, and Tim check out the tank. 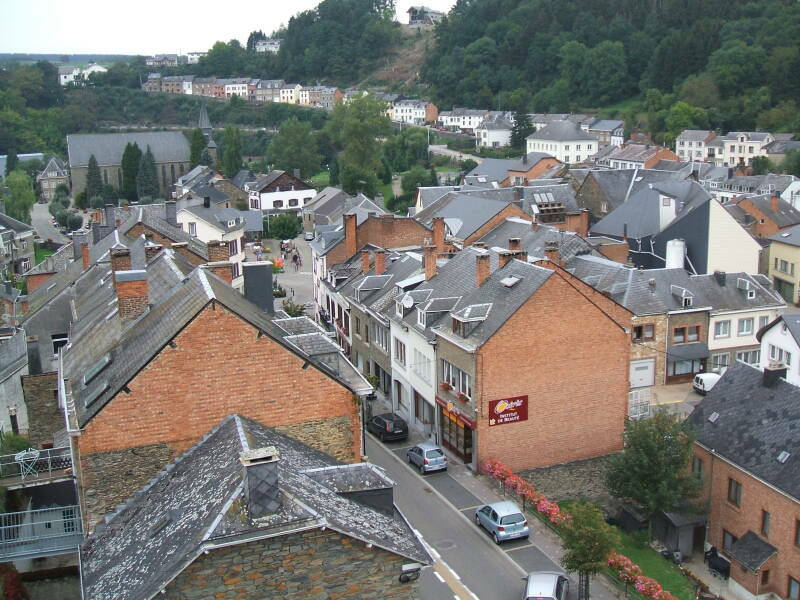 Here is the view to the north and south over Houffalize, from a high point at the center of town. 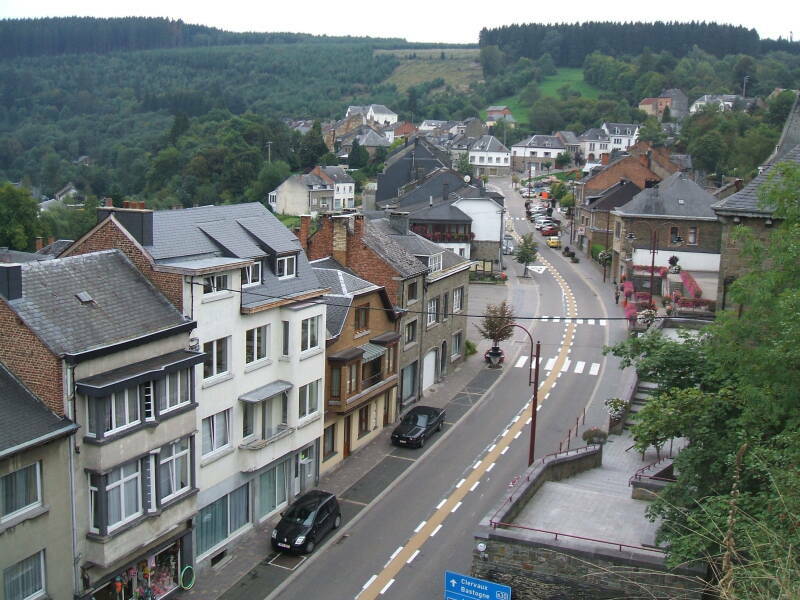 See: The Ardennes region is largely rural, wooded and hilly! U.S. and British forces met up here, with General Patton approaching from the south and General Montgomery from the north. 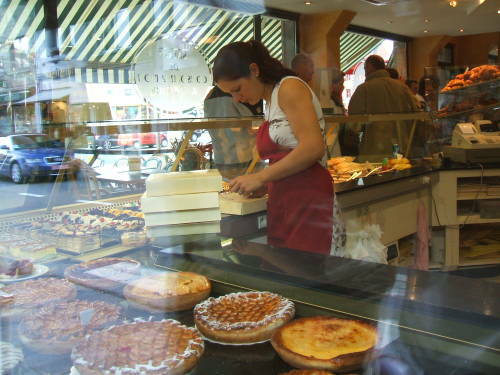 We would always ogle the pastry and the girls at the patisseries. In Houffalize I realized that I had been in Belgium for a while but I had not yet had a Belgian waffle! Quickly! To the waffle store! 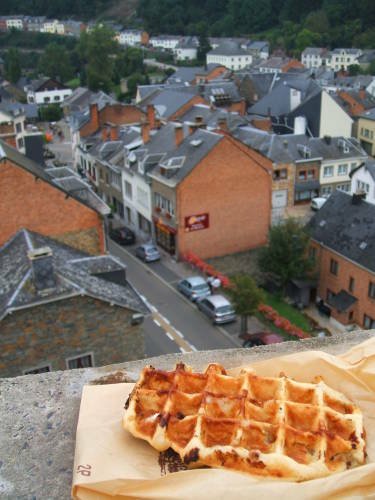 Here is my real Belgian waffle overlooking Houffalize. The German combat unit Kampfgruppe Peiper, part of the 1st SS Panzer Division, executed 90 unarmed American prisoners of war at a crossroads outside the town of Malmedy on 17 December 1944. This massacre along with others committed by the same unit the same day and on following days was the subject of a war crimes trial in 1946. Hitler had ordered that the German forces carry out brutality on a level usually seen just on the Eastern Front. SS-Obersturmbannfuhrer Joachim Peiper ordered that no quarter be granted, no prisoners taken, and no pity shown toward the Belgian civilians. Kampfgruppe Peiper killed many more prisoners, but the total number is uncertain. Some sources estimate that 538 to 749 POWs were victims of Peiper's men's war crimes. 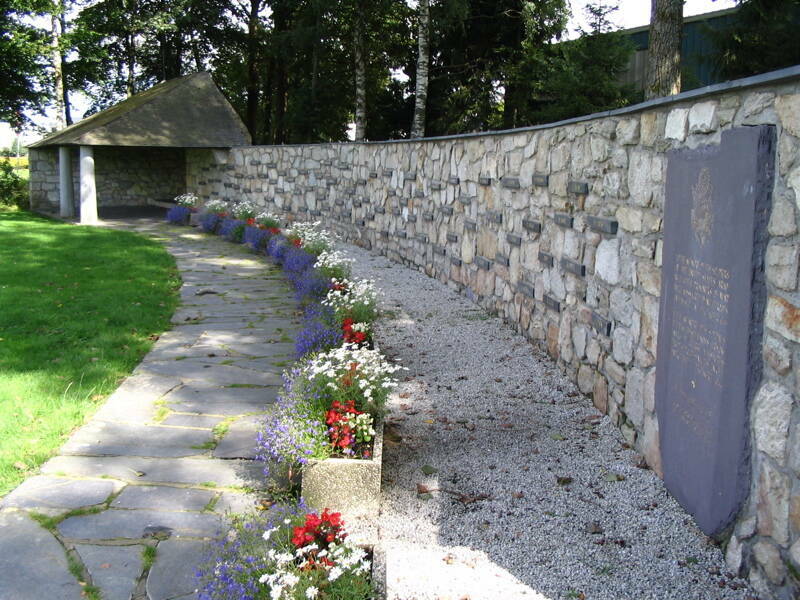 A U.S. Senate subcommittee investigation listed just 362 POWs and 111 civilians, in addition to the 90 POWs killed at Malmedy. Joseph McCarthy, a Senator from a heavily German-American state, took advantage of the subcommittee investigation to raise his political profile, stating that the convicted war criminals had not been treated fairly. All were released from prison by 1956. Television blowhard Bill O'Reilly has repeatedly described this as a massacre of German prisoners by Americans. He did this twice while interviewing retired General Wesley Clark in October 2005 and May 2006, and then he repeated the claim in May, 2011. Fox "News" initially changed their transcripts to cover up what O'Reilly really said. Why do Fox and O'Reilly hate America so much? 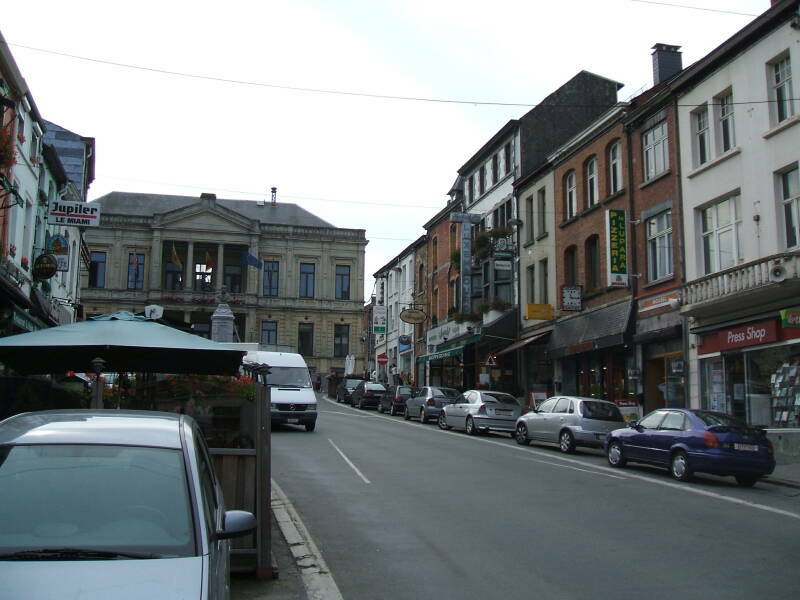 Saint-Hubert is yet another interesting town in Belgium. A major settlement here goes back at least to a Gallo-Roman villa. A Christian community was established here in the 8th century. They built an abbey over the villa's site around 819. A plaque on this hotel on the main square says that Ernest Hemingway stayed there while in the area as a war correspondent. We visited Saint Hubert on our way back to Brussels. 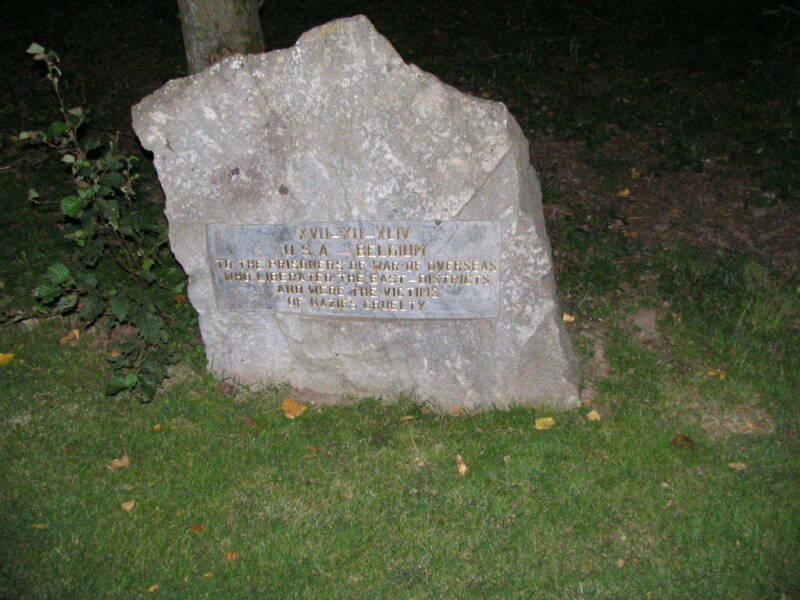 It is said to be where Jägërmëïstër was invented. See the statue of the hart inside the big church. 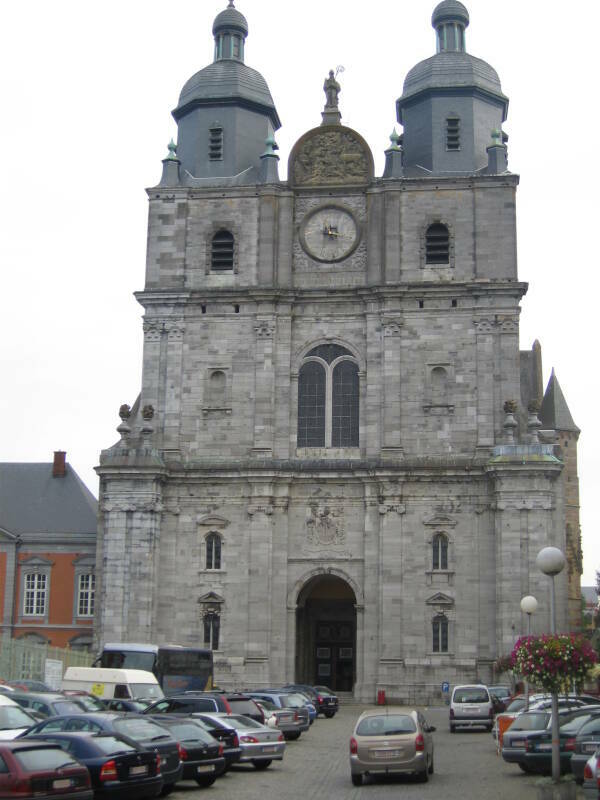 Hubert de Liège was born in Aquitaine between 656 and 658 and died in 727 after being active in the Christian church in today's Belgium, becoming Bishop of Liège. A legend arose in the 15th century that Hubert was such an enthusiastic hunter that he could not resist hunting on a Good Friday. No one else would accompany him on that day. He encountered a white deer with a bright cross between its antlers. He chased the deer, which outran him without tiring. 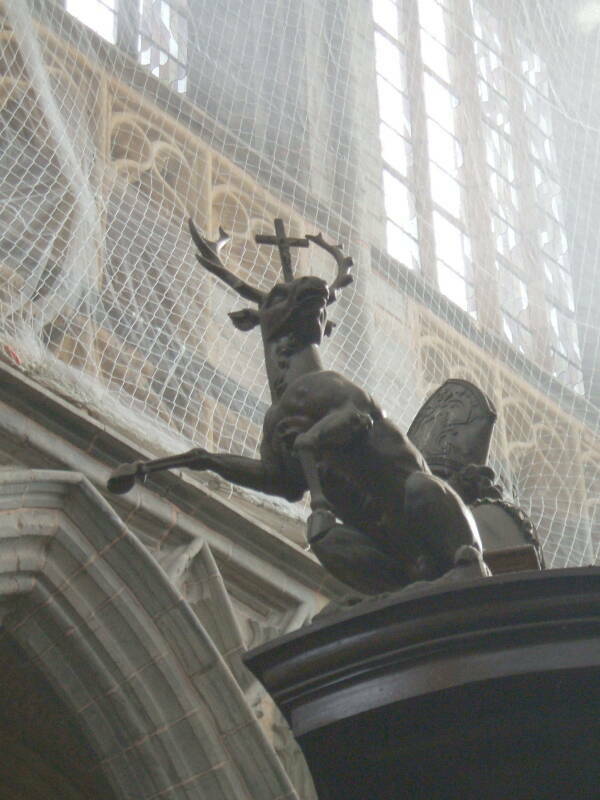 After a long chase the deer stopped and a voice thundered from heaven chastising Hubert for chasing game on Good Friday, telling him to go to Bishop Lambert in Maastricht to repent and do penance for his sins. THE OVERNIGHTER — 1 adult dose Nyquil and an equal volume of Jägërmëïstër. Mix, enjoy, do not operate motor vehicles or heavy machinery. THE MEDITERRANEAN — 1 shot olive oil, 2 shots Jägërmëïstër, garnish with olive and feta. THE HONEST ABE — 1 shot Jägërmëïstër poured over 1 shot of Log Cabin Pancake Syrup. WHEN IT RAINS IT POURS — 2 measures Jägërmëïstër to 1 measure Morton's Table Salt. THE DIABETIC COMA — 2 shots each: pancake syrup, Karo corn syrup, Jägërmëïstër; serve over crushed ice in sugar-crusted margarita glass accompanied with an insulin injection. THE JEAN-LUC PICARD — A cup of Earl Grey Tea with one shot of Jägërmëïstër. THE CONTACT HIGH — Take equal volumes of Jägërmëïstër and Vicks Vāp-Ō-Rūb, mix into a salve and apply externally. THE SMOOTH OPERATOR — Full adult dose of ExLax dissolved in two shots of Jägërmëïstër. THE DISASTER — A double Smooth Operator. SAUDI SUNRISE — equal measures of orange juice, Nyquil, Aqua-Velva, and Jägërmëïstër; have your Bangladeshi servant mix and serve.